Tapioca pudding is currently underappreciated. Tapioca is made from cassava (yuca) root vegetable. Tapioca pears is made from the starch extracted from the roots of the cassava plant. It is considered kosher for Passover. 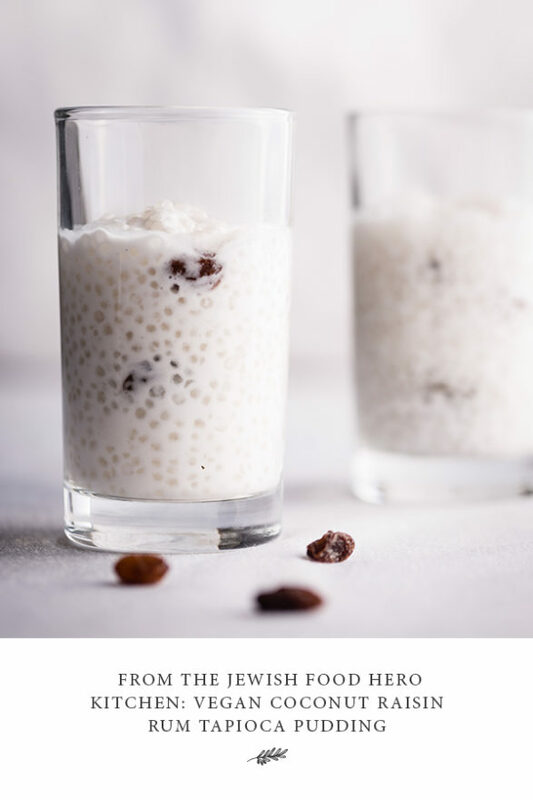 I got the idea for this tapioca pudding recipe from living in Cambodia as Tapioca is a favorite and popular dessert food. I think that tapioca is a comeback Passover food. I asked my parents and aunts and uncle and they all agree that they enjoyed tapioca pudding in their youth. This “old-fashioned” food is perfect for Passover breakfast or dessert because it is comforting and versatile. Tapioca pudding is a lifelong food that can be enjoyed by everyone – from babyhood to old age. It is a gooey, creamy mouth food that is eaten by the spoonful. The added rum soaked raisins makes the dessert fancy and may reminds me of a favorite ice cream flavor. This food photo was taken in Siem Reap Cambodian by humanitarian photographer Regis Binard. In general, he runs photography tours in Cambodia and other exotic locations but he was nice enough to take this food photo for me. I used Bob’s Mills small tapioca pearls because they are certified kosher and I trust this brand. I listened to an episode of the How I built This Podcast with featuring Bob Moore and hearing his tell the story of the Bob’s Red Mills Brand made me feel even more connected to this brand. Cook over medium heat, stirring frequently, until mixture comes to a gentle boil.